U.S. President Richard Nixon's 1972 visit to China (officially the People's Republic of China or PRC) was an important strategic and diplomatic overture that marked the culmination of the Nixon administration's resumption of harmonious relations between the United States and China after years of diplomatic isolation. The seven-day official visit to three Chinese cities was the first time a U.S. president had visited the PRC; Nixon's arrival in Beijing ended 25 years of no communication or diplomatic ties between the two countries and was the key step in normalizing relations between the U.S. and China. Nixon visited China to gain more leverage over relations with the Soviet Union. When the communists took over in China in 1949 and the nationalists fled to the island of Taiwan, the United States allied with, and recognized, the Republic of China as the sole government of China. Before his election as president in 1968, former Vice President Richard Nixon hinted at establishing a new relationship with the PRC. Early in his first term, Nixon, through his National Security Adviser Henry Kissinger, sent subtle overtures hinting at warmer relations to the PRC government. After a series of these overtures by both countries, Kissinger flew on secret diplomatic missions to Beijing in 1971, where he met with Premier Zhou Enlai. On July 15, 1971, the President shocked the world by announcing on live television that he would visit the PRC the following year. The week-long visit, from February 21 to 28, 1972, allowed the American public to view images of China for the first time in over two decades. Throughout the week the President and his senior advisers engaged in substantive discussions with the PRC leadership, including a meeting with Chairman Mao Zedong, while First Lady Pat Nixon toured schools, factories and hospitals in the cities of Beijing, Hangzhou and Shanghai with the large American press corps in tow. Nixon dubbed his visit "the week that changed the world", a descriptor that continues to echo in the political lexicon. Repercussions of the Nixon visit continue to this day; while near-immediate results included a significant shift in the Cold War balance—driving a wedge between the Soviet Union and China, resulting in significant Soviet concessions to the U.S.—the trip spawned China's opening to the world and economic parity with capitalist countries. The relationship between China and the U.S. is now one of the most important bilateral relationships in the world, and every successive U.S. president, with the exception of Jimmy Carter, has visited China. The trip is consistently ranked by historians, scholars, and journalists as one of the most important—if not the most important—visits by a U.S. president anywhere. In addition, a "Nixon to China" moment has since become a metaphor for an unexpected, uncharacteristic or overly impactful action by a politician. Improved relations with the Soviet Union and the PRC are often cited as the most successful diplomatic achievements of Nixon's presidency. After World War II, Americans saw relations between the United States and the Soviet Union deteriorating, the Soviets consolidating communist allies over much of Eastern Europe, and the potential victory of Communist forces in the Chinese Civil War. The American ruling class was concerned that communists might dominate schools or labor unions. In China, from the beginning of the Sino-Soviet Split in 1956, there was a perceived necessity for external allies to counterbalance the power of the USSR. While the split was originally motivated, in part, by Mao's view of the Soviets as too accommodating toward the US, eventually he came to view the USSR as the greater threat to China's position. First, an opening to China would give us more flexibility on the world scene generally. We wouldn't just be dealing with Moscow. We could deal with Eastern Europe, of course, and we could deal with China, because the former Communist Bloc was no longer a bloc. Kissinger wanted more flexibility, generally. Secondly, by opening relations with China we would catch Russia's attention and get more leverage on them through playing this obvious, China card. The idea would be to improve relations with Moscow, hoping to stir a little bit of its paranoia by dealing with China, never getting so engaged with China that we would turn Russia into a hostile enemy but enough to get the attention of the Russians. This effort, in fact, worked dramatically after Kissinger's secret trip to China. Thirdly, Kissinger and Nixon wanted to get help in resolving the Vietnam War. By dealing with Russia and with China we hoped to put pressure on Hanoi to negotiate seriously. At a maximum, we tried to get Russia and China to slow down the provision of aid to North Vietnam somewhat. More realistically and at a minimum, we sought to persuade Russia and China to encourage Hanoi to make a deal with the United States and give Hanoi a sense of isolation because their two, big patrons were dealing with us. Indeed, by their willingness to engage in summit meetings with us, with Nixon going to China in February, 1972, and to Moscow in May, 1972, the Russians and Chinese were beginning to place a higher priority on their bilateral relations with us than on their dealings with their friends in Hanoi. One of the main reasons Richard Nixon became the 1952 vice-presidential candidate on the Eisenhower ticket was his strong anti-communist stance. Despite this, in 1972 Nixon became the first U.S. president to visit mainland China while in office. Ulysses S. Grant visited China on a world tour after leaving office. Herbert Hoover lived in China briefly in 1899 before becoming President and could speak Mandarin. Dwight D. Eisenhower made a state visit to Taiwan in 1960, during the period when the United States recognized the Republic of China government in Taipei as the sole government of China. Air Force One landing in Beijing on February 21, 1972. Mr. Nixon, his wife, and their entourage left the White House on February 17, 1972, spending a night in Kaneohe Marine Corps Air Station, Oahu, Hawaii. They arrived the next day in Guam at 5 pm, where they spent the night at Nimitz Hill, the residence of the Commander, Naval Forces, Marianas. The next morning, February 21, at 7 am the Nixons left Guam for Shanghai. After 4 hours in the air, the Nixons arrived in Shanghai. From Shanghai, the Nixons travelled to Beijing. From February 21 to 28, 1972, U.S. President Richard Nixon traveled to Beijing, Hangzhou, and Shanghai. Almost as soon as the American president arrived in the Chinese capital, Chairman Mao summoned him for a quick meeting. Secretary of State William P. Rogers was excluded from this meeting and the only other American present besides Kissinger was Kissinger's assistant Winston Lord. To avoid embarrassing Rogers, Lord was cropped out of all the official photographs of the meeting. They figured that it was humiliating enough that the National Security Adviser was with the President at this historic meeting, but the Secretary of State was not. To add on top of that the fact that the Special Assistant to the National Security Adviser was there as a third person but the Secretary of State was not was too much, even for them. The Chinese clearly must have been puzzled by this, but they readily went along with this request. Although Nixon was in China for a week, this would be his only meeting with the top Chinese leader. Unknown to Nixon and the rest of the American diplomats at the time, Mao was in poor health and he had been hospitalized for several weeks up to only nine days before Nixon's arrival. 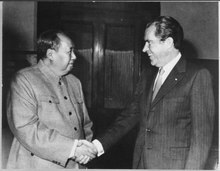 Nevertheless, Mao felt well enough to insist to his officials that he would meet with Nixon upon his arrival. Upon being introduced to Nixon for the first time, Mao, speaking through his translator, said to Nixon: "I believe our old friend Chiang Kai-shek would not approve of this". The meeting lasted for about an hour. I remember distinctly, coming out of the meeting somewhat disappointed. I was impressed with the physical impact of Mao. It was also clear that this man was tough, ruthless, and came from a peasant background, in contrast to the elegant, Mandarin quality of Zhou Enlai. However, I thought that the conversation was somewhat episodic and not very full. Kissinger had sort of the same reaction as I did. Mao was speaking, as he usually did, in simple brush strokes, whereas we were used to the formal, elegant and somewhat lengthy presentations of Zhou Enlai. Mao would just throw in a few sentences; a few brush strokes. He went from topic to topic in rather a casual way. ... However, as we thought about it, and certainly by the end of the trip, we realized in fact that Mao had put in a very skillful performance. In his understated and unorthodox way he had set forth the main lines of Chinese policy, he had made clear the features that he considered very important, and that other things could fall into place. Mao was self-deprecating, even though he had a tremendous ego. He had some humor. He had gotten through his agenda purposefully, even though it seemed casual and episodic. He had managed to cover the main points. I still don't think that it was one of the great conversations of all time. However, I think that Mao was much more purposeful and skillful than we gave him credit for at first. Nixon held many meetings with Chinese Premier Zhou Enlai during the trip, which included visits to the Great Wall, Hangzhou, and Shanghai. Nixon's porcelain swans statue, a gift to Mao, was presented along the way in gift-giving ceremony. At the conclusion of his trip, the United States and the PRC governments issued the Shanghai Communiqué, a statement of their foreign policy views and a document that has remained the basis of Sino-American bilateral relations. Kissinger stated that the U.S. also intended to pull all its forces out of the island of Taiwan. In the communiqué, both nations pledged to work toward the full normalization of diplomatic policy. The Chinese agreed to a peaceful settlement of the Taiwan question. The statement enabled the U.S. and PRC to temporarily set aside the "crucial question obstructing the normalization of relations" concerning the political status of Taiwan and to open trade and other contacts. However, the U.S. continued to maintain official relations with the government of the Republic of China in Taiwan, and did not break off until 1979, when the U.S. established full diplomatic relations with the PRC. This was the week that changed the world, as what we have said in that Communique is not nearly as important as what we will do in the years ahead to build a bridge across 16,000 miles and 22 years of hostilities which have divided us in the past. And what we have said today is that we shall build that bridge. Nixon and his aides carefully planned the trip to have the biggest possible impact on television audiences in the United States. The media coverage of the trip was overwhelmingly positive. Later interviews with correspondents who traveled with the President show how eager they were to be on the trip, which some labeled the most important summit meeting ever. Richard Nixon wrote many books about his international contributions and accomplishments. Beyond Peace is the last of his post-career volumes, addressing the need for the United States in a world transformed by the collapse of the Communist bloc. John T. Downey and Richard Fecteau, CIA operatives who were held captive in China from November 1952, were released after Nixon's visit to China. Nixon's Trip to China was well-planned, virtually choreographed. His every move was rehearsed. The media played a vital role in assuring Americans back home were able to see Nixon communicating with Chinese government officials; attending dinners; and being accorded tours with other people of influence. Nixon played the role of an international statesman. Americans paused and observed and garnered respect for Nixon. Because of this, visually televised confirmation citizens were receiving on the daily national news, presidential approval ratings rose to almost 56 percent. After his return from a packed week of meetings and photo opportunities, American citizens were asked what they thought the impact of this trip would have on the role of the United States internationally. In a poll taken in March 1972 conducted by Gallup, the results stated that more than fifty percent of the group found the trip effective in terms of improving world peace. Max Frankel of The New York Times received the Pulitzer Prize for International Reporting for his coverage of the event. The visit inspired John Adams' 1987 opera Nixon in China. It was also the subject of a PBS documentary film, American Experience: Nixon's China Game. ^ Joan Hoff. Nixon Reconsidered (New York, NY: BasicBooks, 1994): 182. ^ "Labor's Communists Come Under Fire". Life. Time. 22 (12): 31–35. March 24, 1947. ISSN 0024-3019. ^ a b c d Kennedy, Charles S. (28 April 1998). "Nixon Goes to China". The Association for Diplomatic Studies and Training: Foreign Affairs Oral History Project. Retrieved 21 February 2013. ^ Stephen E. Ambrose. Nixon, the Triumph of a Politician 1962–1972 (New York, NY:Simon and Schuster, 1989): 439. ^ Burr, William. "Negotiating U.S.-Chinese Rapprochement". The National Security Archive. Retrieved 8 July 2018. ^ Tenembaum, Yoav. "CHINA POWER Kissinger's Visit, 40 Years On". The Diplomat. Retrieved 8 July 2018. ^ "Getting to Beijing: Henry Kissinger's Secret 1971 Trip". US–China Institute. ^ "The Week that Chenged the World". Richard Nixon Foundation. ^ a b http://www.upi.com/Audio/Year_in_Review/Events-of-1972/1972-Election/12305688736666-2/#title "Nixon Goes to China". Accessed 2009-04-15. Archived 2009-05-05. ^ Nixon's China's Visit and "Sino-U.S. Joint Communiqué"
^ a b "Assignment: China – The Week that Changed the World". US–China Institute. Dallek, Robert (2007). Nixon and Kissinger: Partners in Power. New York: HarperCollins. Drew, Elizabeth (2007). Richard M. Nixon. New York: Times Books. Ladley, Eric (2002) Nixon's China Trip, Writer's Club Press; (2007) Balancing Act: How Nixon Went to China and Remained a Conservative. MacMillan, Margaret (2007). Nixon & Mao: The Week that Changed the World. New York: Random House. Mann, James (1999). About Face. New York: Knopf. Nixon, Richard (1978). RN: The Memoirs of Richard Nixon. New York: Grosset & Dunlap. Tudda, Chris (2012). A Cold War Turning Point: Nixon and China, 1969–1972. Baton Rouge, LA: Louisiana State University Press. Tyler, Patrick (1999). A Great Wall: Six Presidents and China, Public Affairs. Wikimedia Commons has media related to 1972 Nixon visit to China.